The Bay Ridge restaurant scene is much like a revolving door. Mediocre pubs and bars magically pop up and mysteriously disappear a few months later, going out as quietly as they went in. A bright new sign hangs above the vacant storefront promising a new and better restaurant. What bothers me most is seeing a new place open and unsuccessfully racking my brain for the memory of what sat there just 6 weeks earlier. Then there are the places that come and stay, breathing new life into the current food scene, something different from just another pub. I’m hoping Brooklyn Beet Company is a keeper. 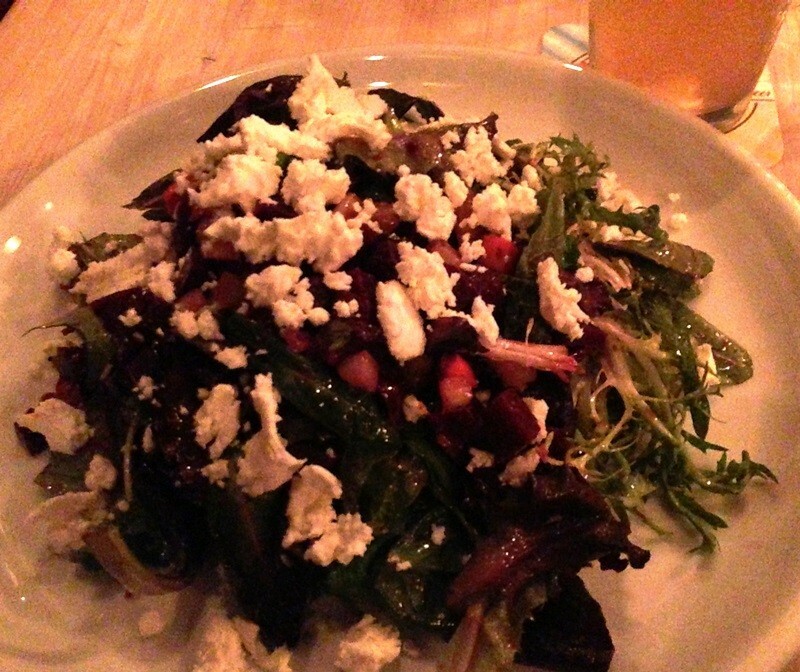 The Brooklyn Beet Company is not the place you go for a fancy dinner. It’s meant for small groups and communal gatherings. If you think you might be in the way, you probably are. The restaurant is no more than a long corridor with a bar up front. Tables are big considering the narrow space, but only three tables of 8 plus few high tops squeezed against the opposite wall. Chef Owner Otto Zizak grew up on his family farm in Eastern Czechoslovakia. The farm to table cuisine, highly grounded in Beets, as the restaurant’s name suggests. Not having yet warmed up to beets I was excited to see a number of alternative but just as tasty options litter the menu. The food is considered modern European according to Yelp. It incorporated foods and flavors completely foreign to me. 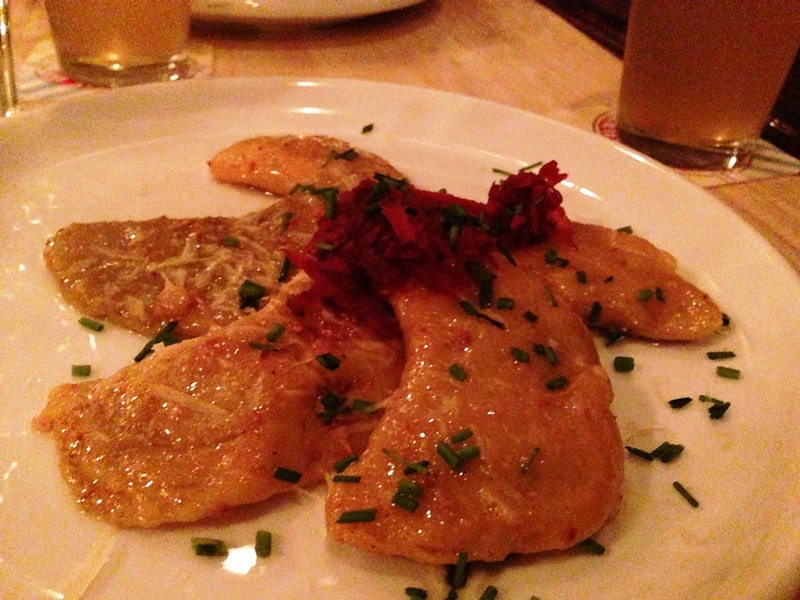 My Dumpling of the Day was filled with turnip-squash puree, wild mushrooms and aged asiago cheese. What sat in front of me was more a collection of perfect ravioli. Light pasta filled with a delicate filling. So delicate, however I was unable to separate the flavors of squash and asiago, leaving me with a plain mushroom ravioli. This was followed by Duck Spatzle. I was expecting tiny pasta noodles, only to learn that spatzle in some Eastern European cuisine is made more like gnocchi. The root veggies and broth that accompanied the dish was amazing. 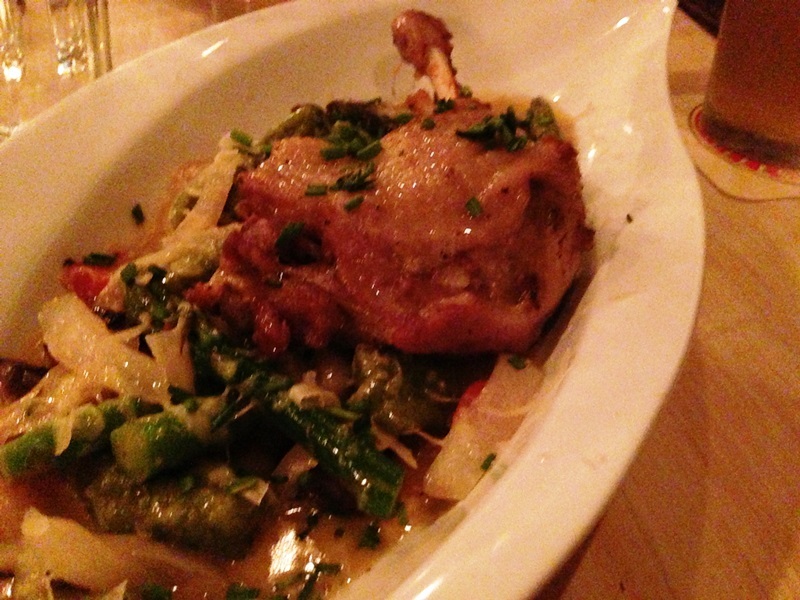 As good as the duck confit was (and I’m a BIG duck fan), it almost felt like an afterthought. I would have happily eaten the vegetarian version with just as much pleasure. Not my favorite meal ever but certainly a great new addition to Bay Ridge with plenty of potential. I was lucky enough to visit the Brooklyn Beet Company shortly after opening. There are certainly some kinks and inconsistency in the food—my too lightly filled dumplings and surprisingly dense spatzle considering pasta dish number one was light as air—but that can easily be choked up to opening jitters and growing pains. I can’t wait to visit again, a few months later with new produce to shine and flavors to impress. The Brooklyn Beet Company is located between 72nd and 73rd street on Third Avenue. They are open daily for dinner and weekend brunch. They have a full bar and feature sustainable European wines and craft beers. Visit them also at Smorgasburg every Saturday in late June. Haha, it’s not that far 😛 There was a Hawaiian coffee shop right down the street from me. The guy who owned it was so nice, they had amazing coffee but the food was so so and pretty slow. Every time I went in there it was pretty empty and I kept telling everyone I knew to visit because I didn’t want them to close. I think they lasted a year, maybe 2. That was one of saddest closings I’ve known in a while. Aw, it’s even worse if you get to know the owner well. It’s a shame that they didn’t manage to improve the service and food quality 😦 It must’ve been so lovely for them to have you as a regular though. I do the same, I fiercely support my local coffee shops and establishments! Looks delicious, I wish they had a place like this in Colorado. Where in Colorado are you? I felt like there were lots of awesome options when we were in Boulder. Keep searching! Great review! Sounds like a unique place with loads of potential. I hope they do well and that you next meal there is improved. Kudos to you for accepting the growing pains and supporting a farm to table family restaurant that seems to be committed to doing things right. I do hope they make it! Thanks! I never like to judge a place negatively on first visits (unless some things were really awful, like staff). Even my favorite standbys have had an off day here and there. Yeah, really hope they make it!